The Sinn U2 EZM 5 Schwarz (Black) has become one of our best selling watches and for good reason - it's tough, packed with technology and looks great on your wrist. This watch is far more than simply a black version of the standard Sinn U2. When Sinn first introduced the U Diver's Series several years ago, the most requested feature was an all Tegimented watch (the standard U models feature a Tegimented bezel). After the initial U Series was released, Sinn began development of two watches that featured a Tegimented bezel, case, crown and case back, the first of which is the Sinn U1000 and the second this watch. The Sinn U2 Black is constructed from the same steel that is used on the outer hull of submarines. The steel was procured by Sinn from a steel supplier to Emden GmbH, one of Germanys North Sea shipbuilding yards who construct submarines from the very same steel. Next, the Sinn U2 Black features a completely Tegimented case, bezel, crown and case back. Standard steel used by most watch companies has a hardness of between 200 and 240 HV (Hardness Vickers is a common scale used to measure material hardness). The Tegiment layer on this watch in combination with the PVD coating has a hardness in excess of 2,000 Vickers which is more than nine times harder than standard steel. The Tegiment layer is not a coating consisting of a foreign material, instead the steel itself that has been hardened using a special engineering process that creates a hardened barrier. This process increases the submarine steel's resistance to corrosion, as well as provides extreme protection from scratches and other damage to the case. The technology and design elements used to create the new Sinn U2 Black go far beyond standards used at most watch companies. The uni-directional ratchet operated rotating bezel is also milled from this submarine steel. The indices are machined directly into the bezel without the use of bezel inserts, which can corrode or come loose at deep depths. The international testing lab of Germanischen Lloyd has tested the Sinn U2 Black, and determined that the watch can be certified as water resistant to 2,000 meters. This same firm tests submarines for their ability to withstand the effects of underwater use. This is a watch with "attitude". The new black case design and black bezel are all Sinn, and present an almost "stealth" appearance. And this watch has to perform - it's part of the EZM family of watches. Sinn is known for their professional special forces watches, called the Einsatzzeitmesser (EZM - in English "Mission Timer") series. Sinn has long been a supplier of watches to various divisions of the German special forces, including the GSG-9, border protection, customs, military and special police divisions. Designing watches for these units carries a number of requirements, including resistance to shocks, water, magnetism and temperature changes among others. "Sinn U2 Black EZM 5"
Verified Owner Comments: I ordered the black one with the black bracelet and the silicon strap. The fit and finish are absolutely first class. The whole execution is beautiful. Nothing compares to it at any price and I don't say that lightly. It fits very well and is very comfortable on the bracelet. It is easy to read. The second time zone is handy for travel in fact the watch is so excellent I almost want to plan a trip just so I can wear it - maybe snorkeling in Hawaii (too cold here in San Francisco) or hiking and snow shoeing in Yosemite or on a river cruise somewhere. It's awesome! "An Amazing Watch (U2 Black EZM 5)"
Verified Owner Comments: I am glad that I added this watch to my collection. It is a very accurate watch. I have had it for about 3 weeks now and kept it on or on the watch winder and it is just a few seconds off from the Atomic Clock I used to make the original settings. I have a small wrist about 7.25 inches circumferance but the watch with the integrated metal bracelet work well. The watch is just a little taller than I am use to but it is not overwhelming. I agree with another reviewer, the slight dome on the crystal give a sort of magnification effect when you catch the light just right, it is a nice effect. I have the all black and it is great, The watch is very rugged looking. I had a great experience in the purchasing process, got good advice from the representative in helping me choose three different watches and the product arrived on time and in perfect condition. I'm glad I stepped out from the Swiss Only watches I have in my collection and added this Sinn. 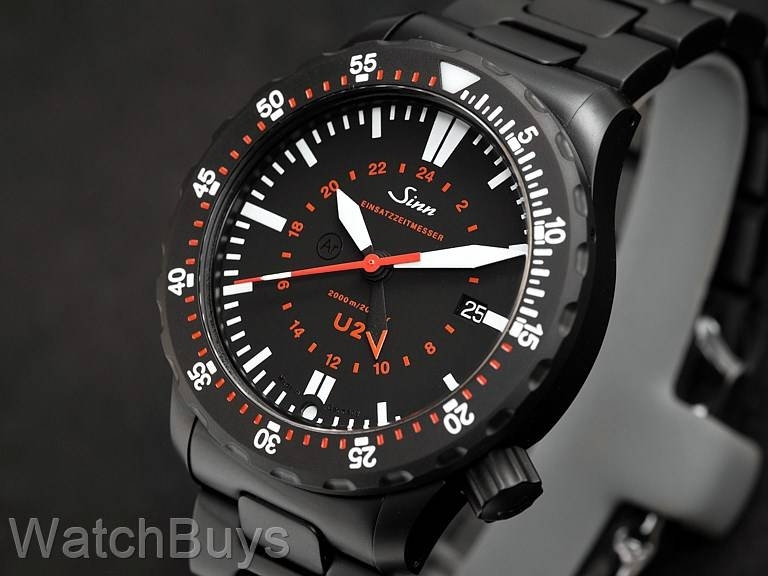 "Sinn U2 black case and bracelet"
Verified Owner Comments: Great watch. Heavy, but get used to weight after few wears. Feels very durable. WatchBuys had excellent customer service. They contacted me prior to receiving product to let me know about returns, etc., and were helpful when sizing band. Only negative is small speck on inside of crystal that can be seen in sunlight, and is a little annoying, but not visible inside. Overall, I am enjoying the watch. Thank you. Verified Owner Comments: I had been wearing a Sinn 857 (switching back and forth between the rubber strap and metal bracelet) for the last year and a half before ordering this U2. Been wearing the U2 for 3 weeks now and like it. It's significantly chunkier than the 857 in thickness and weight - in a good way. The black coating has a strange and cool, almost rubbery feel to it. It's also easier to read. The red 24 hour markers and hand are kind of subdued and the dial is a bit simpler in general. There is also a slightly bigger difference in length between the hour and minute hand compared to the 857 which makes a big difference in night-time legibility. I am NOT so impressed with the durability of the black finish. After normal/light wear there is already a small scratch on both the bezel and case lug edges where silver is showing through. Nothing major but expected a bit better. Rate deviation so far is excellent. Verified Owner Comments: The watch is everything that I expected it to be. I was also very pleased with the service that was provided by WatchBuys: Questions were answered immediately, the shipping process went very smoothly, and I always had the feeling that I was in good hands. Great product, great service, I am looking forward to do business with you guys again soon. "Hot out of the box"